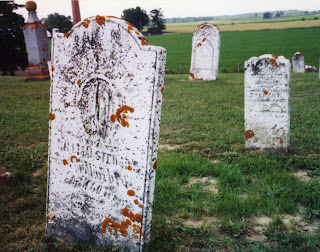 Although I have Stiver relatives buried at this cemetery, I have yet to visit this cemetery. The following photos came to me from Holly at Raeburn Family Odyssey. Some of her family connections are buried there. Wm Stewart b abt 1800 County Monaghan Ireland d abt 26 Jan 1876, emigrated with wife Susan McCormack and children (all born in Ireland) c 1840. Children: Samuel b 1819, John b 1824 , George b 1830 , William b 1831, Mary b 1833, Alex b 1835 , Margaret b 1837, Richard b 1840. Wm & Family lived on the County line of Grey/Simcoe Co in Maple Valley, Osprey Twp Grey County. The photos were taken by Dorothy Hiltz of Collingwood who has given her permission for these photos to be posted here. Thank you Holly and Dorothy. I will post more of their photos in another posting. The Sun Times headline of an article on December 30, 2008 pA2 read "Monuments toppled, vaults exposed at cemetery"
The culprit was the thaw and heavy rains that came down recently in this area. 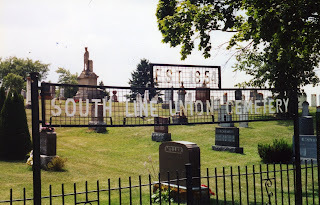 The section involved is the oldest section (southern section) of Edgehill Cemetery in Colpoy's Bay, Albemarle Township, South Bruce Peninsula, Bruce County, Ontario. The creek above the cemetery overflowed. The graves in this area are from the early 20th century.The Grey Bruce Health Unit sent an inspector to assess the situation. that she expects recommendations on repairs once the municipal office reopens next week. Staff will be making some recommendations as to how to restore the site as quickly as possible while maintianing the dignity of the persons and the families involved. The cemetery is closed from public visitiation as a safety measure until work can be done. The municipality placed a notice in the December 30 edition of the newspaper "Notice to Relative of Persons buried in Edgehill-Colpoy's Bay Cemetery. "The municiaplity is attempting to contact relatives of those graves involved and maintain the security and dignity of the area." This is the first time I have heard of flooding and erosion problems in cemeteries in this area. I am pleased that the municipality is trying its best to protect the area and to preserve the sanctity of this cemetery.